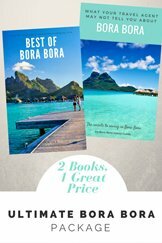 Do you only have one day in Bora Bora? 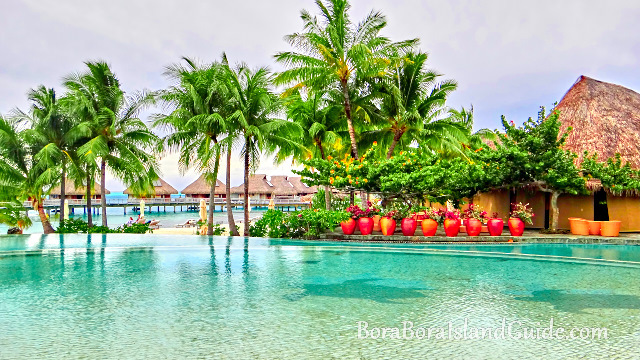 These favorite Bora Bora activities and attractions can be visited independently. 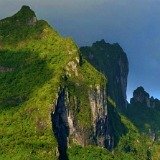 As Bora Bora is an island surrounded by motus, getting to them is a unique experience. Boat is a main form of transport. 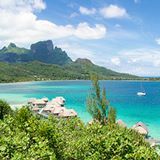 Here's what to do if you're visiting Bora Bora from a cruise ship and how to get there. 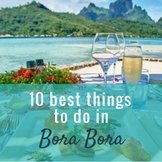 There are also free things to do in Bora Bora. 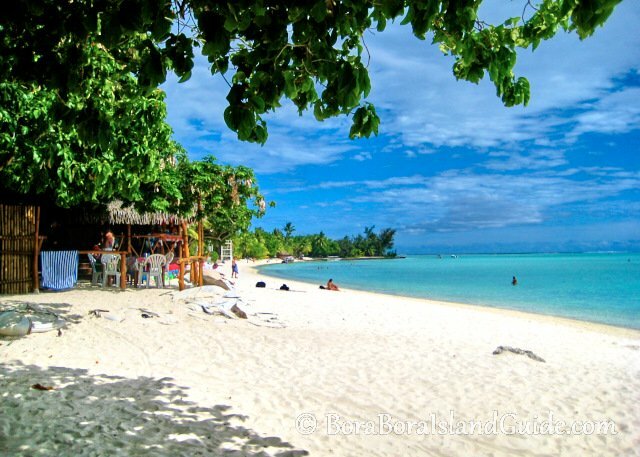 Matira Beach has been voted “Best Beach in the World” numerous times. 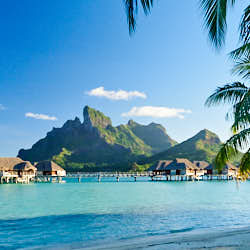 This long stretch of white sand, with calm turquoise water, is one of the main Bora Bora attractions. It's the only public beach on the main island so usually has a happy mix of locals and tourists. To get to Matira Beach from the cruise ship is very easy. Take the tenders to the dock. 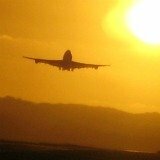 Then turn to your right and you will see taxis and shuttle buses waiting. They're so pleased to have a Bora Bora cruise ship visit. Some will even have a sign in their window saying “Matira Beach”. The ride is about 10 minutes and goes past Bloody Mary's. So it is a good idea to visit Bloody Mary's while you visit Matira Beach. The Le Moana Intercontinental, across the road from Matira beach, doesn't accept visitors on days when a cruise ship is in. It chooses to keep the grounds private for guests. Getting your photo taken at Bloody Mary's is one of those Bora Bora activities you must do to show you were there. 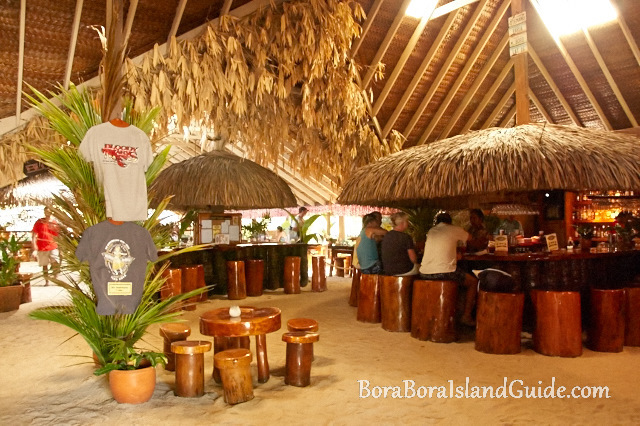 The famous, sand floor, Bloody Mary's restaurant is a short taxi ride from Vaitape. If you want to see it at its best, visit at diner time. 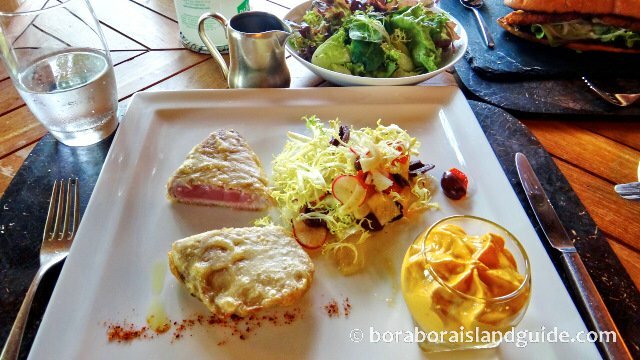 The menu is an array of fresh sea food and meat, laid out to choose from. Bloody Mary's is open for lunch too, but it is a much simpler affair than dinner. Any time is good for a cocktail. If you continue further south down the road you will get to Matira Beach. But take a taxi if you can. We tried to walk it and it was further than we thought. We ended up hitching a ride to get there. 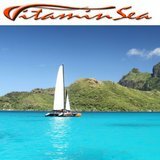 Wanting to hire your own boat in Bora Bora? Yes it is possible and it's such a fun way to explore the lagoon. You don't need a license but you do need a bit of common sense. You will be given a map that shows where you can and can't go around the island. The independence of scooting across the blue lagoon on a boat is such a thrill. 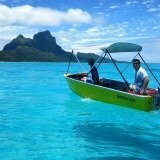 Each time I go back to Bora Bora I always include a day of boat hire like this as it's one of our favourite Bora Bora activities. 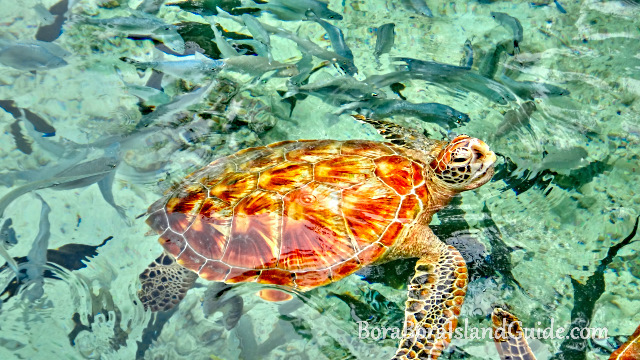 You can take the time you want to snorkel at each spot, stop for photos as you please, and linger on beaches. If you are going to take a lagoon excursion as well, do that first, as you will have more awareness of the layout of the lagoon. Otherwise, just make sure you have a good map reader! La Plage has a limited number of boats so make a booking. 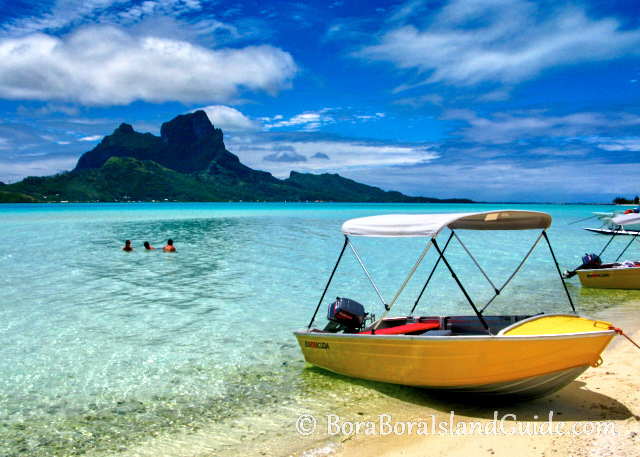 To get to the Bora Bora boat hire you can request a complimentary pick-up from the Vaitape pier. 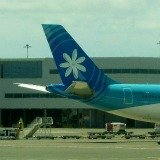 Or you can ask a taxi to drive you to the old Novotel, which has now become the Bora Bora Beach hotel. Buy some refreshments at Tiare mini-mart just down the road. The boat will have an eski. 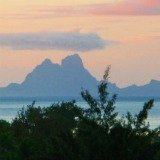 To visit Le Meridien Resort from a Tahiti cruise you need to pre-arrange with the resort. You must make a booking to swim with the turtles in their sanctuary, as it is done in a supervised way. 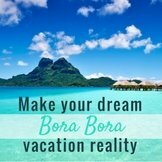 This is one of the most inspiring Bora Bora activities. The marine biologist gives a fascinating talk at a set time in the morning. To get there, take the cruise ship's tender to Vaitape and then catch a taxi to the Le Meridien dock. Le Meridien's shuttle boat will pick you up at the set time and drop you back at the end of your visit to the Turtle sanctuary. Ask the concierge to ring a taxi to meet you when the boat arrives back at the Le Meridien's dock on the main island. The Hilton Nui is on a volcanic motu close to the main town of Vaitape. 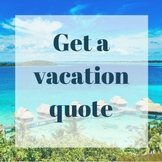 It's one of the easiest resorts to get to on a Bora Bora Cruise because the Hilton has regular boat shuttles straight to Vaitape, for it's guests. To visit the resort you will need to pre-organize with the Hilton. They welcome visitors for lunch or dinner, and a swim in their beautiful infinity pool set on the beach. Try a vanilla sundae. Savoring these ice-creams on the beach is another of those unforgettable Bora Bora activities that we look forward to going back for! Their hotel shuttle leaves from a little pier behind the Robert Wan pearl shop in Bora Bora. This is a very short walk from the main Vaitape dock. They will pick you up (no need to pay then). After your visit, purchase shuttle tickets (for about $7) from reception, before you catch the boat back to the Robert Wan Pier. Booking lunch at the St Regis is a great way to have a look around this luxurious resort. Or if the last tender to the cruise ship allows, you could have a cocktail and dinner at its sophisticated Lagoon Restaurant. It's right on the water and has a world famous French chef. 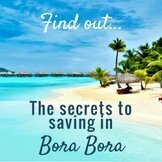 This is one of the more expensive Bora Bora activities but you'll be reliving it for years! To get to the St Regis, take the ship's tender to Vaitape and catch a taxi to the St Regis Resort's dock. It's a short distance past the Le Meridian's dock. Allow about 25 minutes for the drive and time your trip to catch the St Regis shuttle schedule. At the end of your visit ask the concierge to arrange for a taxi meet the St Regis boat at it's dock on the main island. The Intercontinental Thalasso Spa uses mineral-rich water drawn from more than 800 meters under the sea. Your spa treatment allows you to have access to the beautiful spa grounds for half the day. 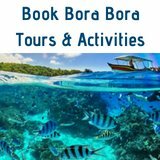 These are very special Bora Bora activities. It's facilities are unlike any other. 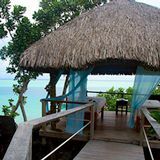 There is a swim spa, chiller ocean walk, deep sea cold plunge, steam rooms and jacuzzi s with the best view of Mt Otemanu. Make sure you book ahead. To get to the Thalasso Deep Ocean spa, take a taxi to the Intercontinental Le Moana (just next to Matira Beach) and ask reception for directions to the pier. Catch the free shuttle boat across to the Intercontinental Thalasso resort. 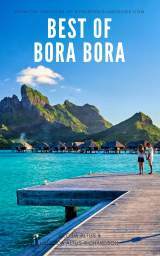 Want to find out more about getting around on your own to do Bora Bora activities? 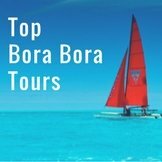 See the Bora Bora cruise page.